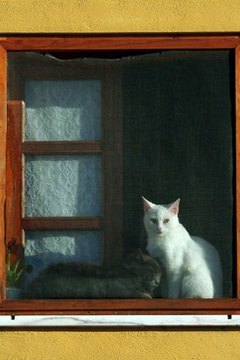 Cats love to perch in windows. You know it's safer for Kitty indoors, but you feel sorry for her when she wants outside for fresh air. You could install a window shelf for her to sun and bird-watch, but you don't want to mar the walls with screws. Fortunately, this dilemma has more than one solution. Measure the width of the window, and the height of the sill from the floor. Jot down those measurements. Cut two pieces of lumber the same length as the height measurement minus 2-1/4 inches, from a 1-by-12-inch board. For example, if your window ledge is at 30- inches from the floor, cut the two boards to 27-3/4 inches each. Cut three pieces of 1-by-12-inch lumber to the width measurement you wrote down, and mark them boards A, B and C. Temporarily set aside boards B and C.
Trim a piece of foam rubber to the same size as board A and glue it to the top with a few dots of hot glue at the edges. Measure and cut a piece of heavy fabric, like denim, canvas or upholstery cloth, to a size that is two inches wider than board A all the way around. Turn board A foam-side down on the floor, and staple one long edge of the cloth to the underside of the board about an inch in from the edge using a staple gun. Stretch the cloth across the foam and fasten the other side to the opposite edge of the board. Do the same for the ends of the board, tucking and stapling cloth around the corners as you work. Drill a 1/16-inch pilot hole in the center and at each of the four corners of board B, about 2 inches from each edge. Fasten boards B and C to the top and bottom of the long boards using four, 1-1/2-inch wood screws to connect each corner of the frame. Measure the resulting box frame and draw a rectangle that size on a 1/4-inch piece of plywood. Cut the shape out with a saw and tack the plywood to the back of the frame with 2D, or 1-inch, box nails. Sand and stain or paint the shelf unit as desired. Align the bottom of Board A with the top of the shelf, or board B, and fasten the two together from the underside with five wood screws through the pilot holes in B. Place the shelf below the window sill, add some weight, like books or bricks, on the bottom to prevent wobbling, if necessary, and stand back to watch your kitty bask on her new, padded shelf. Measure the inside height and width of the window, and purchase two tension rods, such as those used for hanging curtains, to fit the height measurement. Cut a piece of 1-by-12-inch board, using the width measurement of the window less 1/4-inch, to fit over the existing window sill. Sand and finish the board, or upholster as described for the free-standing unit. Place the shelf on the window sill and insert one tension rod vertically within the window frame – against one corner of the shelf and the underside of the top window frame on the same side. Place the second rod against the opposite corner of the shelf on the other side of the window frame. Tighten the tension rods firmly, and test to ensure the shelf is secure by adding weight to the outer edge. Consider putting another shelf or two inside the framework of a tall free-standing shelf unit. Just cut the extra shelves 1-1/2-inches shorter than the top and bottom shelves, and screw them in place from the outside on the sides. Use them to store favorite toys and treats. As an alternative to building one, add the padded shelf to an inexpensive purchased unit of a similar size using the steps described. How Long Can Cats Be on Tapazole? Is Human Formula for Kittens? 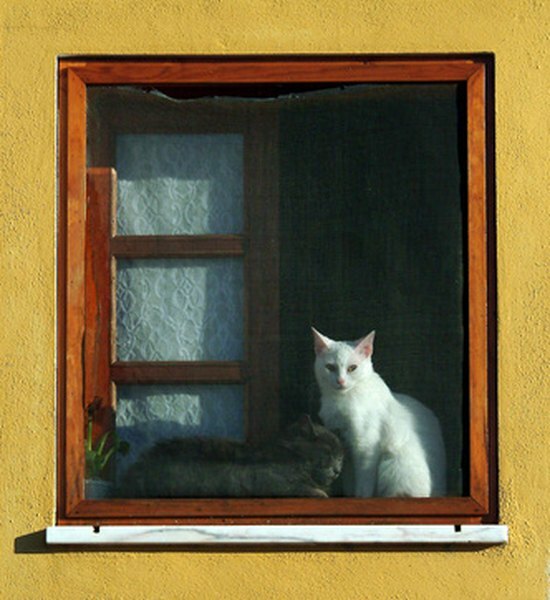 What Nutritional Needs Do Cats Have?